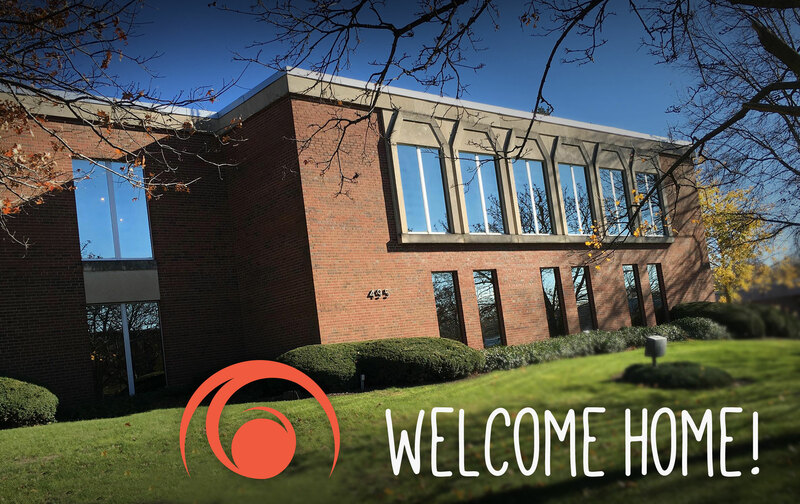 It’s official… Array Creative is all moved in! While it was bittersweet to bid farewell to the 6th floor of the United Building, our newly renovated space of the old, “Builders Association of Akron” has proven to be the right choice. The new studio, located at 495 Wolf Ledges Parkway in Akron, is a stand-alone building with ample parking, an outdoor area for entertaining and offers plenty of space to grow with our clients’ needs. Not to mention we still have a full run of floor to ceiling windows allowing us to enjoy this beautiful view of the downtown Akron sunset! Why move again you ask? News of the United Building receiving a tax credit to renovate into a 65-room boutique hotel prompted the search for our new home. You can read more about that HERE. While excited for the continuous beatification of Akron (with the announcement of the United hotel project), the team and I were equally excited to begin our very own beatification project of our new space. We must have researched/walked through every available space from Akron to Canton! Once the decision was made, renovations began. Have a look at our Facebook page HERE for a few pics of the process – while there, be sure to give us a like! Array would like to thank all the contractors including Quality IP, Two Men and a Truck and building management at The University of Akron Research Foundation for all their hard work. The space looks beautiful and we are already enjoying the new digs. The only thing left to do is… schedule your visit! Hope to see you soon!